PM asked if he bears any responsibility for escalating situation. 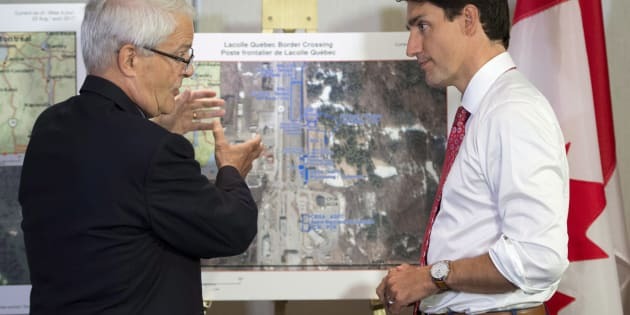 Prime Minister Justin Trudeau is briefed on the refugee installations at the Lacolle border crossing by Transportation Minister Marc Garneau prior to a meeting with the Intergovernmental Task Force on Irregular Migration on Aug. 23, 2017 in Montreal. Prime Minister Justin Trudeau maintained Wednesday that his message for those hoping to find refuge in Canada has stayed consistent, even as rivals accused him of misleading asylum seekers. Trudeau met with a federal-provincial task force in Montreal Wednesday tasked to deal with an influx of nearly 7,000 people who have crossed into Quebec from New York in the last two months. Most are Haitians who fear deportation from the United States if their temporary protected status is lifted. At a press conference, the prime minister was asked if he bears any personal responsibility that thousands of people uprooted their lives to come to Canada. Many of those asylum seekers are now housed temporarily between Montreal's Olympic stadium and a conference centre in Cornwall, Ont. "We have always been a society that is proud of being open to welcoming immigrants, welcoming refugees, and the reason Canadians are open to immigration and refugees is because we have confidence that it is going to be a success," Trudeau responded. Trudeau said the criteria for what it means to be accepted as a refugee, including statelessness and exposure to torture or death, hasn't changed. "That is entirely consistent with what we have always said," he said. "We will continue to defend the integrity of our immigration system and remain careful stewards of an extraordinarily precious asset in this 21st century world, which is to have a population positively inclined towards immigrants, towards refugees, understanding that being welcoming and open is a source of strength. "And that hinges on having confidence in the system and process in place. And that is something that we will always defend." Trudeau said he understands the concerns Canadians may have about uncontrolled immigration, but repeated that security checks are being enforced. "You will not be at an advantage if you choose to enter Canada irregularly. You must follow the rules, and there are many," he said. Yet, asylum seekers who cross illegally at unofficial border crossings are advantaged. The Haitian asylum seekers — approximately 80 to 85 percent are individuals who fear they will be deported from the United States next January once their visas expire — would not have their cases heard if they showed up at a regular land border. They would be turned away and told to apply for refugee status in the States. The irony is Haitians who arrived in Canada after the 2010 earthquake through a similar program and received visas on humanitarian grounds with the chance to apply for permanent residency saw that program expire last August. This March, Canada began deporting hundreds who had not sought permanent status back to Haiti, two government officials told HuffPost Canada. Immigration, Refugees and Citizenship Canada also notes that 50 per cent of Haitian asylum claims were rejected last year. Haitian-Canadian Liberal MP Emmanuel Dubourg is now headed to Miami to counter misinformation among the large Haitian diaspora about Canada's refugee rules. Trudeau explained his government isn't planning to alter the Safe Third Country Agreement. That's the pact between Canada and the U.S. which mandates that refugees claim asylum in the first country on which they arrive. Since the agreement only applies at official points of entry, asylum seekers from the U.S. have sought to reach Canadian territory outside of those points. Canada is obliged under international law to process those claims. Hundreds of refugees from the U.S. also came to Canada throughout the cold, winter months, largely in Quebec and Manitoba. Conservatives and New Democrats charged Wednesday that Trudeau has sent mixed messages on the issue, pointing to a hugely popular tweet that made headlines around the world. In January, Trudeau tweeted that Canada would welcome those fleeing persecution, terror, and war, regardless of their faith. The tweet was sent on the same day U.S. President Donald Trump moved to bar refugees and visitors from seven Muslim-majority countries. Trudeau's message was picked up by major news outlets such as CNN and The New York Times. It has so far been retweeted more than 400,000 times and boasts more than 770,000 "likes." He delivered a similar message online in March. "Regardless of who you are or where you come from, there's always a place for you in Canada." At an earlier press conference in Ottawa Wednesday, Tory immigration critic Michelle Rempel blasted Trudeau for giving "false hope" to those crossing the border illegally. Rempel said Trudeau's #WelcomeToCanada tweet launched a "a number of ships" in terms of global news stories contrasting Canada to the U.S.
"I absolutely think that set the tone," Rempel said. "Man, was that ever irresponsible." Canadians of all political stripes want to help the world's needy, but want the asylum system respected, Rempel said. She was also repeatedly pressed by reporters to say what Tories would do differently in light of the ongoing situation in Quebec. "Do you think that Justin Trudeau has had any culpability in this situation?" Rempel asked a journalist, at one point. Rempel, a former cabinet minister, largely promoted the last government's record and said Tories wouldn't have tweeted "five minutes after the American government made an executive order on immigration." NDP immigration critic Jenny Kwan released a letter to Immigration Minister Ahmed Hussen on Tuesday, accusing Liberals of spreading false information to asylum seekers. New Democrats have called for the Safe Third Country agreement to be suspended, arguing that the U.S. is no longer a safe nation for refugees and that asylum seekers should be able to cross at official checkpoints. Kwan's letter highlighted Trump's anti-immigration policies and the recent protest of white nationalists in Charlottesville, Va. The NDP critic wrote that Trudeau's #WelcomeToCanada tweet initially made her proud and reassured Canadians this country was a "beacon of hope" for those fleeing persecution. "Sadly, in the weeks and months that followed, my feelings changed dramatically," Kwan wrote. "Many are now asking whether the Prime Minister was truly interested in following through with substantial action or if he was instead content with the spike in international attention and praise that came with it." Kwan accused the Liberal government of not preparing enough to handle the "manageable issue" and noted how Trudeau has recently taken to saying there is "no advantage" for asylum seekers to cross outside border points. Kwan said that message not only contradicts Trudeau's tweet but is "intentionally misleading." "Under the so-called Safe Third Country Agreement, Canada is forced to turn away asylum seekers who attempt to enter the country at official ports of entry," she wrote. "This leaves desperate asylum seekers with few options, and many feel they must take the risks of crossing the border in-between ports of entry." Kwan urged Hussen to take action that embodies the message Liberals expressed not so long ago. "The situation cannot be ignored any longer," she wrote.